It’s that time of year when we have the first opportunity to taste a wide selection of the new Barbareschi. This month the 2007 is showcased at a series of dinners in local restaurants aptly named “Barbaresco a Tavola”. The minimum requirement is for 2 year’s ageing (beginning 1st January following harvest) of which at least 12 months must be in oak (usual) or chestnut. 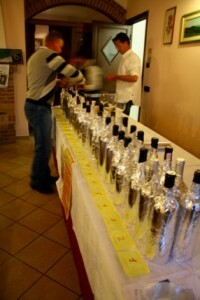 Last week (7th May) we attended a “blind” tasting of 24 wines at Casa Nicolini. Not all the local producers offer their wines as they believe the wines are too young to show their best and that means that some of the top reputations are missing. Certainly the wines are very young but the cream always floats to the top and so comparisons across the vintage are revealing. Once again the overall quality was of a high standard, with only 2 or 3 wines that were poor and those names we have politely forgotten. Since 2002 there has not been what you could describe as a bad vintage.